Dr Patrick Bernard O'Kelly, after whom this orchid was named, lived in The Burren and devoted much of his time to the study of the wildflowers growing there. After his death in 1937 he was buried in the graveyard at Dumcreedy Church, near Ballyvaughan. 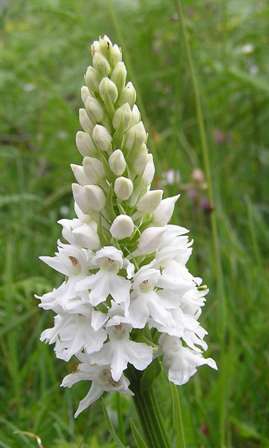 This controversial orchid is treated as a separate species by some botanists and by others as an indeterminate variety of Common Spotted-orchid Dactylorhiza fuchsii. O'Kelly's Orchid usually grows to between 20 and 50 cm in height, buttaller specimens sometimes occur. The leaves are narrower than those of Common Spotted-orchid and they are not marked. 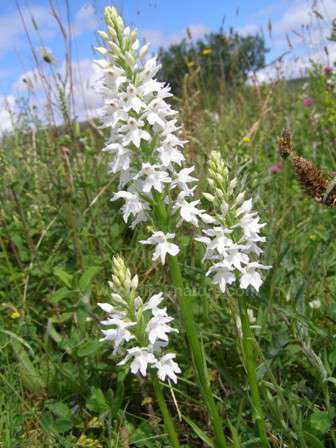 The flowers O'Kelly's Spotted-orchid are often completely white, although some have faint pink markings. Although mainly associated with The Burren, this orchid occurs in several other counties of Ireland including Galway and Fermanagh as well as in Scotland and on the Isle of Man. O'Kelly's Spotted-orchid (also referred to simply as O'Kelly's Orchid) grows in the unimproved limestone meadows of The Burren, but it sometimes ventures into marshier areas there too. Dactylorhiza fuchsii subsp. Okellyi flowers in May and June.